WHAT IS THE PROCEDURE FOR ARRANGING MAKE-UP LESSONS? HOW OFTEN SHOULD MY CHILD COME TO SWIMMING? Coming to swimming lessons once a week, on a year round basis, is great for swimmer progress. If it is possible to get your swimmer in the water twice a week we will see even more rapid improvements. However there is a learning curve with lessons so do not expect your child to make equal and constant progress at each lesson. Swimming caps are compulsory, goggles are recommended. We have all the other equipment required on site. Please bring your own towel to dry off post lesson. ARE SWIMMING SUPPLIES AVAILABLE FOR PURCHASE? Yes, we have goggles, microfiber towels, swimming caps, floatation belts and swim nappies available for purchase. The pool temperature is 32 degrees in summer and 34 degrees in winter. WILL I NEED TO GET IN THE WATER? A parent or guardian is required to be in the water for baby classes up until the age of 3. It is best to check with reception when booking to confirm. CAN I SIGN UP MID TERM? It's never too late to enrol your child into swimming lessons. Enrolments are taken at any time throughout the term and term fees are prorated. Each child is treated as an individual therefore no matter when they enrol they will be taught based on their own ability. CAN WE PLAY IN THE POOL BEFORE OR AFTER THE CLASS? We encourage play to be undertaken at either a public pool or an alternate private pool. It is important for the child to distinguish between learning time and playtime. WHAT IS THE PARENTS ROLE DURING THE LESSON? For babies classes we require a parent or guardian to be in the water with the baby at all times. Once your swimmer is comfortable in the water then you are able to watch the lesson from the pool deck. I AM NERVOUS ABOUT MY CHILD STARTING LESSONS, WHAT SHOULD I DO? Any personal fear or anxiety you may have about the water can be easily transferred to your child. Try to be supportive and positive at all times with your child. Inform reception and the instructor privately about your concern and they will support you through your child’s first lessons. WHAT CAN I DO TO HELP MY CHILD LEARN TO SWIM? Encourage your child to attend every lesson. Acknowledge all successes and ignore failures; have a positive approach. 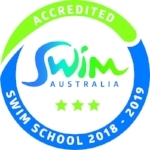 All of our teachers are Austswim Certified and have gone through an additional 30 hours of specific program training.